Interesting fact: neither of my kids has ever actually eaten birthday cake, though they've tasted it. 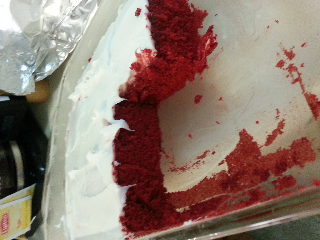 This weekend was my birthday, and I like red velvet cake. But I'm also terribly picky about cakes and frostings, so I'm making my own cake, using a fairly old recipe that my grandmother gave me. This is the kind of thing that bugs my in-laws, because you're not supposed to cook for yourself, but I find I'm more satisfied if I do, so it's just better this way. Besides....I mean, really, what kind of cake has vinegar in it? But this is tasty. I assume she got this recipe from somewhere, but the card in her recipe box yielded no clues. Heat oven to 350. Traditionally, this is made as a layer cake, so grease and flour 2 round cake pans, or one 9x13 pan. Mix vinegar and baking soda in a small cup and set aside. Cream shortening and sugar. Add eggs. Make a paste of cocoa and 1 oz of food coloring (this is a really messy step; I never do it). Add to creamed mixture. Add remaining food coloring to mixture and mix. Add buttermilk and flour a little at a time, alternating. Mix well. Pour into pan(s) and bake 30 minutes. Be really watchful - this dries out quickly if you over bake. The traditional frosting for this cake is listed below - usually, you split each of those round cakes into 2 layers, so you get 4 layers. The frosting recipe is designed for that number of layers, so I'm including alternate measurements to make a smaller amount more appropriate for 2 layers if you're so inclined. For what it's worth, I'm not a fan of this and usually use decorator icing or a can of plain vanilla frosting. Mix milk and flour in saucepan. cook and stir over medium heat until thick. Cool completely (this is important). Cream sugar, margarine, and vanilla. When fluffy add room temperature cooked milk mix slowly, beating as you go. Beat until fully incorporated and fluffy. And there you have it. 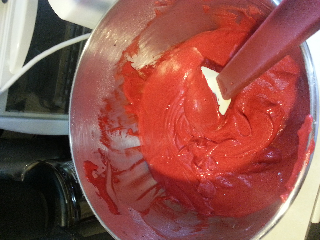 Bright red, not too sweet, and just the right texture. So does the vinegar add a different taste to it? I've never seen a cake with vinegar. I like to make my own icing because store bought is always too sweet. It's definitely a slightly different taste, but the vinegar and baking soda cancel each other out, so it's not sour. Just...not really sweet like most store bought cakes, and more dense than a boxed mix. Honestly, I like it much better than most cake (and I've banished boxed mixes entirely from the house these days).